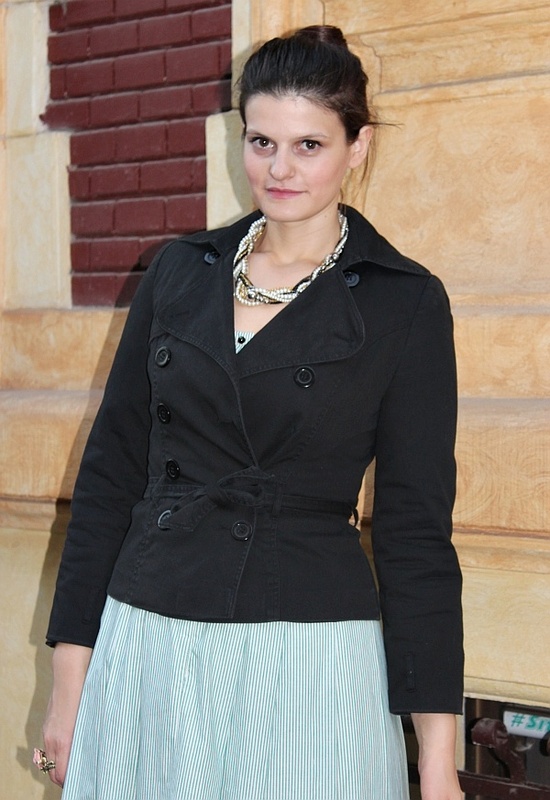 Wearing a full skirt dress with puff out sleeves and a corset type bodice might not be something you think to wear at work, but I did. I my defense it was my birthday. I’m not insane, I wore this last month when the weather was pretty warm still, hence the ruffled metallic sandals I braved the day with. I also have to admit I use any excuse to wear my more outrageous vintage dresses. Any major and minor holiday is a good day for overdressing; sometimes just being Monday is enough. Lots of jewelry are also sacrificed every time I feel like impersonating some blue blood lady – I’m nothing if not committed. :))))). 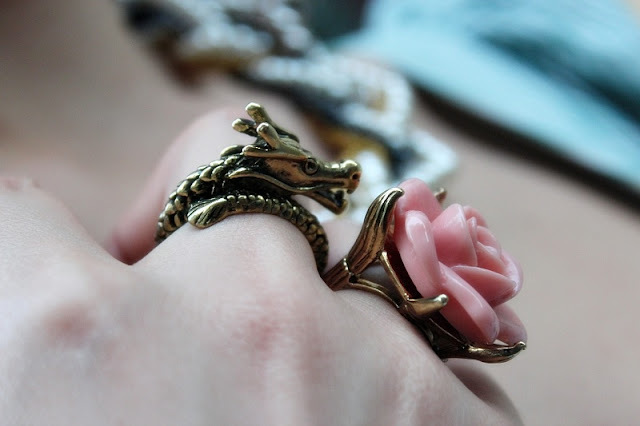 The dragon ring is yet another proof of my sister’s obsession with dragons and anything fantasy (aka "A song of Ice and Fire") related, she’s literally haunting for mythological animal jewelry and I couldn’t be happier. Beautiful!The dress is lovely and it looks great on you! your jewellery compliments the look perfectly! love the rings especially! I hava real soft spot for dresses like this, the minute you put one on you can't help but feel little bit more Grace Kellyish. So sweet! I hope you had a happy birthday, the frock is adorable!! those rings are so major! Hi Sara, thank you for dropping by and leaving a comment. It's very kind of you. You have such interesting costume jewelry pieces which look expensive. I was amazed when I read the caption to find out that you bought them from Forever 21 and New Look. That necklace is fabulous. What a beautiful take on the classic pearls. Love it. gorgeous look and i love your jewlery...! Cute outfit! I like your rings! Thanks for your lovely comment! I'm actually following you via bloglovin! I find it's an easy way to follow blogs. But I'm following you on google too now! Thx for follow! I'm following you back!!! i love your rings and your jacket! I love your jewelery, and those shoes are just plain HOT! So right who needs an excuse to make the most of your wardrobe !! Very lady-like. I love all the jewelry... and don't you just love F21? Have a great day! Oh, I love it! How fun to wear something that really reflects your personality on your birthday. And I especially love the little touches like the rose and dragon cocktail rings. You always have the best accessories!! So beautiful look, dear! Love your blog! Beautiful outfit. I especially love your accessories. That big blue ring is fantastic. Thanks for visiting my blog. I was following you through bloglovin, but I'm now also following you through google friend connect. Your blog is great. Totally Awesome! This is fashion that I like, you looked fabulous on your birthday, by the way ... Happy Birthday late! Gorgeous! You look so pretty and your accessories are amazing! imi plac tare mult sandalele,nu le-am vazut in magazin.te pup! 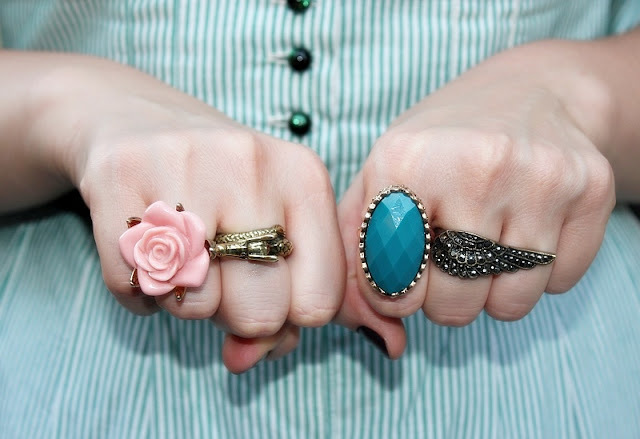 Waooo, I love your rings!! really beautifull!! wow.....so glad you found my little blog as I totally love your style....I now am your newest follower on all social networks! those rings are gorgeous! You look really nice in your dress and I like your rings as well! Thank you for following me I'll follow you back! Thanks so much for stopping by for a visit to my blog. I have added you to my blog list and also became a follower. I love your dress but unfortunately for me, I am short and a little thick around the middle and this dress would only show off my waist which is slowly going by the wayside. I wish I could get by with wearing that dress and those rings and look as lovely as you do I'd be happy! thanks for your lovely comment. I'm following you, hope you can see it =) would you like to follow back??? Thanks for stopping by my blog. Love what you've got goin' on here.... I especially love your eye for accessorizing, to-die-for cocktail rings. 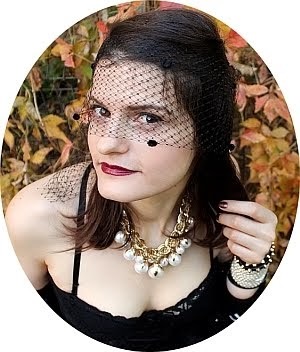 love your retro style♥ these jewelleries are gorgeous! Ur dress, the rings and the total outfit! I love everything about it..and i have followed u back. Omg! I really loveee loveeee and super loveee ur blog. wow I'm seriously loving all your outfits that I see on your blog so far! Amazingly cute and gorgeous<3 New follower now :D can't wait to see more posts from you! Thank you for the comment and the follow my dear! LOve the vintage vibe of the dress, gorgeous!! Thanks for visiting my blog and leaving a comment, I'm glad you like it and I'm so happy to find your blogs too! You look fabulous in your vintage dress, and the accessories are wonderful - my daughter is a ring girl and will drool over the ones you wore! love the dress and the shoulder details ^__^ looks really lovely on you! too bad I cant wear stuff like that cos my shoulders are HUGE so id look weird >__<!! You look amazing and beautiful rings. Thank you so much my dear for passing by my blog,totally following back. Hey! Thanks for the comment & follow on my blog ..following you now as well! Very nice outfit and happy belated birthday! I'm following and thanks for follow back!! This dress is really pretty and I'd love to be allowed to wear this at work ! You look really princessy and the jewelry give it a nice touch !